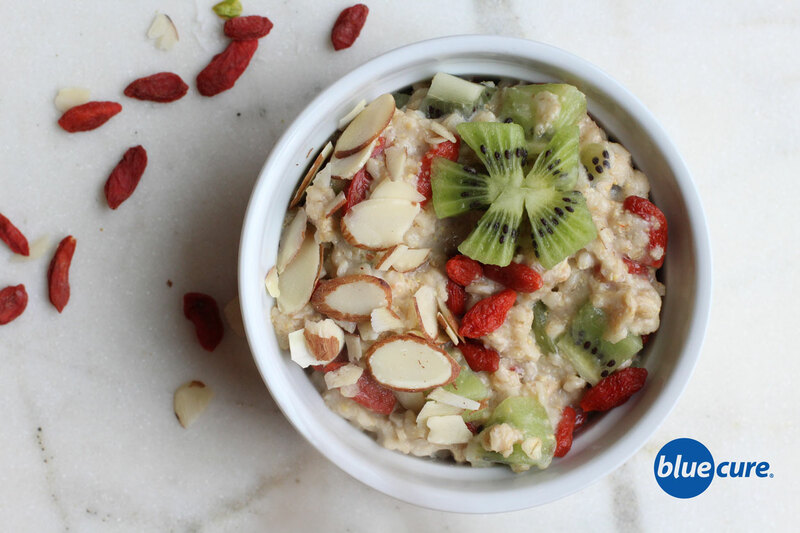 Change up your morning oatmeal routine by pairing your oats with different combinations of fruits, nuts, and seeds. Swirl in some peanut butter, or toss on some sliced almonds to give it different textures or tastes. 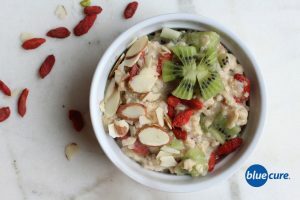 This oatmeal bowl combines antioxidant-packed dried goji berries, fresh kiwi, and sliced almonds for a delicious, nutrient-packed power-breakfast. Kiwi and goji berries are both great sources of Vitamin C, which helps to enhance the absorption of iron from the whole grain oatmeal. Unsweetened plant-based milk of choice (e.g. almond, cashew, soy), to desired texture. Bring ⅔ cup water to a boil. Reduce heat and then add the oats and the goji berries. Stir and allow the oats cook. Wash, peel, and slice the kiwi. When the oats are finished cooking, add the vanilla, ground flaxseed, and unsweetened plant-based milk of choice. Stir the oats and then pour into a bowl. Top with additional plant-based milk, sliced almonds, and kiwi. Enjoy!